This funky bach caters for the whole family (easily 2 families), babies and children are certainly welcome with a portacot and highchair for use. There are also plenty of toys your children can play with as well (including a trampoline!) Pets are welcome too (pref. outside) as section is fully fenced. Kids will have so much fun exploring or sleeping up in the lofts, and adults relaxing in the step down lounge by the fireside in winter or on the sun filled deck in summer! 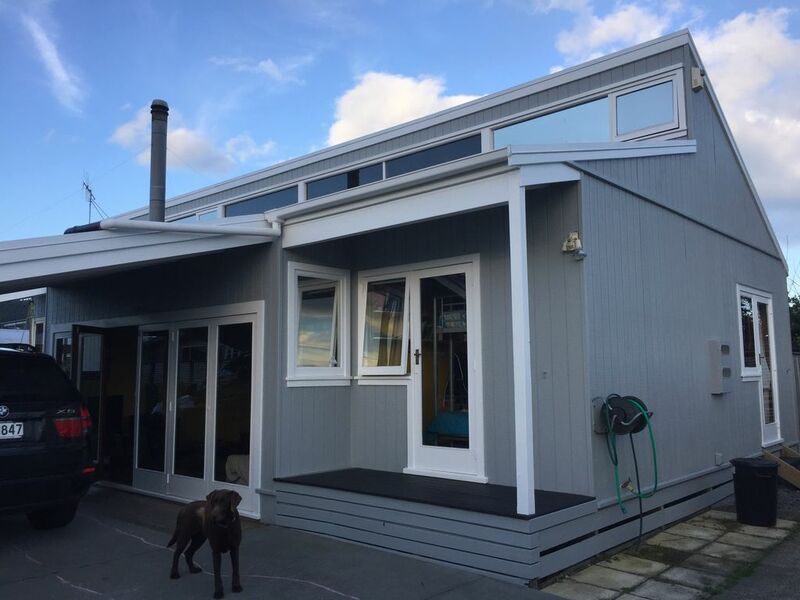 Located wharf end of Whangamata with handy walking distance to shops, beach and developing harbour, what more could you want?! Preferred one week minimum peak times and 2 nights minimum at other times. Stat hols/public hols prices are peak rates any time of year. Most suited to one or two families. Awesome house for a big group, we had a blast staying there and its close to everything, walking distance to town and new world. We had a great time! Loved the house. The Funky bach is in an ideal spot and is great for both adults and children with lots of toys etc for the kids to enjoy. The property is always our first choice when the family needs to get together at Whangamata. The amenities and instructions at the property include everything you need and need to know. Great location. Really close to New World which made meal organistaion easy. Our small dog could roam free in fenced property. Ideal for 2 families if you have toddlers or younger kids. Having only the one loo is harder with older kids and 4adults & for this reason the kitchen is a bit small too - but we coped. Outdoor shower Was favoured over indoor. Comfy beds and fantastic big inside table for meals and endless board & card games. A relaxed, easy Bach to stay at. Great stay very happy, just a couple pointers: toilet seat not fixed properly to toilet bowl, and decking nails need repunching as one of the kids stubbed her toe on one, other than that a cool place.